ATE ELLA DISPENSED with preliminaries and called on Sr. Denise Pineda to say the opening prayer, penned by Christine Sine, for the Holy Week. So felt I have to squeeze it in here: “God, as we walk through Holy Week toward the cross, may we remember the wonder of who You are. Beyond sin, Your love is inexhaustible. Beyond brokenness, Your forgiveness is incomprehensible. Beyond betrayal, Your grace is poured out eternally. Beyond death, Your life is unimaginable. Beyond human understanding, Your ways are always higher than ours.” Amen. 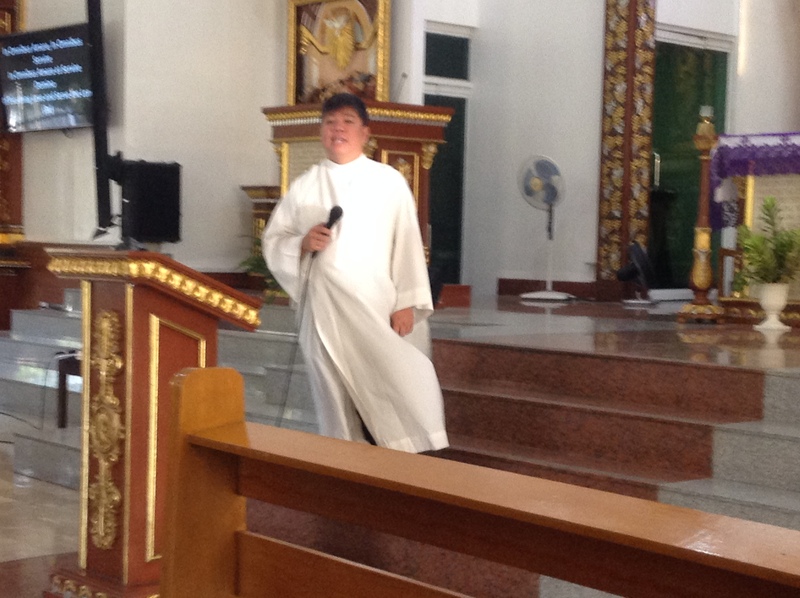 Afterwards, the one-(wo)man formator gave small doses of the guest speaker’s credentials: sobrang in demand, devoted to his Divine Mercy and DMI apostolates, Parish Priest of St. Joseph the Worker Parish in Novaliches, anchor of “Hello, Father 911” on Radio Veritas. Yet, beyond his long list of credits, what enthralled her was how he responded to the call of priesthood, a fact she caught when she watched the Eternal Word Television Network’s (EWTN) feature on him (his moment of fame, she called it) in one the international cable tv network’s segments on upcoming Catholic men of substance. She could not contain herself, therefore, in continuing with her accolades (actual gushes of delight really), like funny at first meet, a bundle of joy later, and would have segued into showing a video clip of him had he not pulled it away from her by his mahiyain excuse so Ate Ella threatened that she will just enumerate the film (whatever that meant and however she would manage it). The banter out of the way, she went on to add that he admitted joining his community’s Holy Rosary crusade because of the food (the half joke stirred the crowd), his ministry was always guided by Mary, and he attributes all his blessings to the Blessed Virgin and his deep devotion to the Liturgy. Thus was introduced Fr. Aristeo de Leon, the idealist from Meycauayan, a long way gone from being my erstwhile formator for the ongoing Paghahawan project onto a sought-after Recollection Master. Not one to acknowledge drumroll or fanfare easily (true to his bashful nature), Fr. 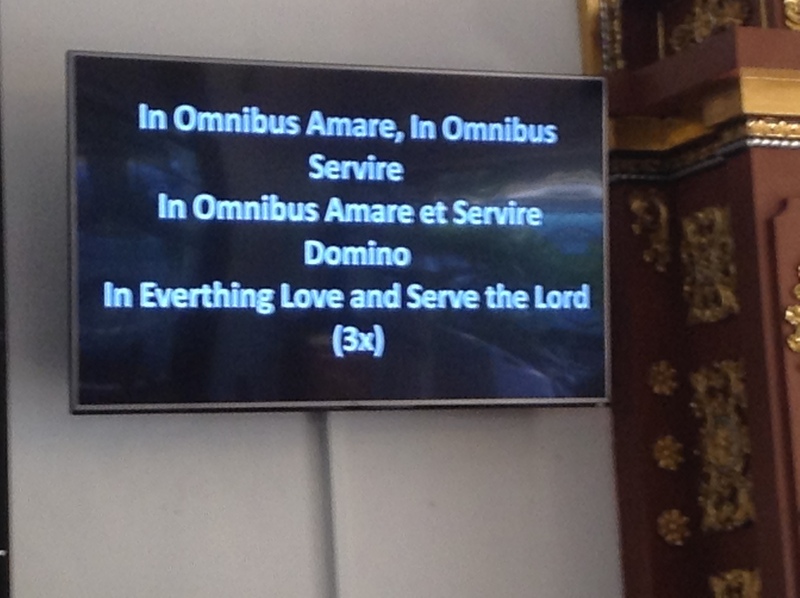 Aris emerged from the pews and went directly to the projector to play “Amare et Servire”. He let us feel the hymn long enough to memorize it, acted out the lyrics and, when we got it down pat, joined us to render a unified homage to God (already an enriching feat). After the Gospel reading, he was set to speak. As early as seven years ago, he started, we have been preparing for 2021, the 500th year of the country’s Christianization. He urged us to turn to our seatmate and see if s/he is excited. There is cause to be excited, he declared because, even the members of the INC were excited when they celebrated their 100th by opening the Philippine Arena, reputed to be largest coliseum in the world. Indeed, only in the Philippines is it happening, yet, he asked, are our brothers aware? From the uneasy rustling in the pews, not many in the audience knew either. So he said, “It is good that in this season of Lent, we are revisiting the faith, looking forward and going to make more disciples of ourselves.” “By March 6, 1521,” he continued, “we remember the first Mass in Limasawa, the baptism of Raha Humabon (christened Carlos, in honor of King Charles of Spain) and Hara Amihan (changed to Juana, after Charles’ mother, Joanna of Castile).” Fr. Aris basically beamed when he recalled the first Christians who looked reverently at the Sto. Niño, that is why it pays to go to Cebu and revisit Magellan’s gift to the Filipinos. 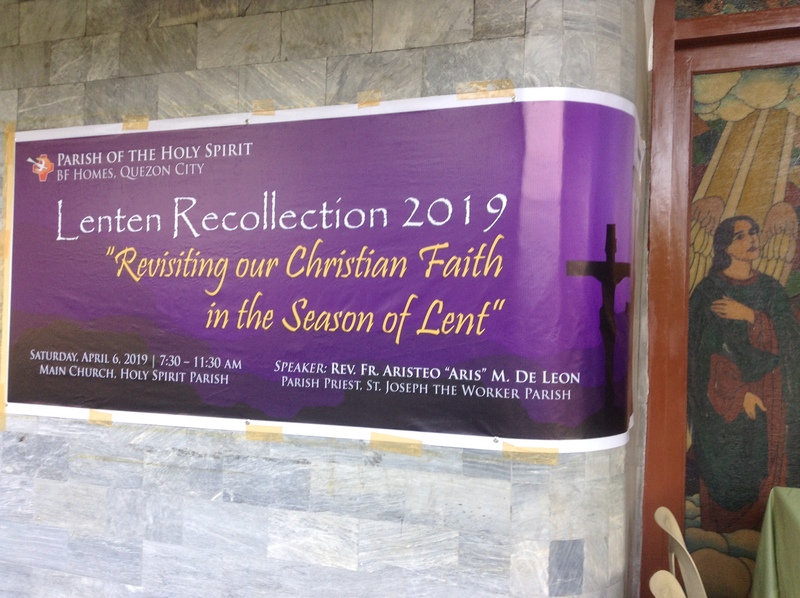 He said that the bishops have prepared for this event through a 9-year novena, when Pope Benedict canonized Pedro Calungsod (his shrine is inside the Bishop’s house, not in SM, as erroneously touted) and asked his audience to repeat “Second Vatican Council”. Because, he added, it gave way to the vernacular Mass, the priest’s back turned to the congregation and gave the laity an active part in the Liturgy. It also marked the Catechism of the Catholic Church’s third year (“Chew on the info,” he urged) and strengthened our faith and evangelization. He himself chewed on the 6-syllable last word, stressed its significance and enumerated its three goals: proclaiming the Word; witnessing to It; and transmitting the Gospel. It is a challenge to lectors and commentators, therefore, to be formed before they can proclaim. Without formation, as is audibly evident in most readers who go up to the ambo, they just read, and he left it at that. Parents have a big obligation, too, he said, in inculcating in their children who the Good News is. He qualified that before one proclaims, one must know Him. And he urged us to ask our seatmate when was the last time s/he read Bible? Because one doesn’t have to be a pastor to recognize the Good Book. Then he asked us to inhale, exhale and relax. Exactly, I knew what he meant by his next question, which was, “When was the last time we talked about Jesus Christ, in our family, while eating? Or when asking for advice?” There is nothing wrong with advice, he said, because that is an opportunity to listen, to tell the other that Jesus loves him. When that happens, it will be easy to take her/him to church. It is no longer relevant to quote the trendy “kung saan ka masaya.” The fact that the person asked is another opportunity to pray that he listens back to you, to not be shy to talk about him. We can start at home, by bringing the homily home, where bida si Kristo, hindi tayo, dahil ang daming magaling magsalita but effective evangelizers are those who live their speech. Especially, he added, we need patience to talk to children. And he told of a dialogue between Inday and her employer, where the latter bombarded the former with questions if Inday has already done the usual various methods of cheating on their retail products and rigging the scales so that they may already pray the rosary. Imagine if a child were listening in on them. He shared another story about a volunteer catechist, who came to him and lamented that her husband cannot understand her. She is up early and in church, she teaches in school, but her husband is angry at her. He offers,“Baka siya ang hindi mo maintindihan, na siya muna bago ang simbahan.” And he added a brief of a daughter complaining that, from the church, her Mom does another homily in the car. And admitted his sadness that, sometimes, baptism becomes a social activity, the priority of which Sacramental occasion revolves around the handa, the sponsors, and no one, especially the infant, listens to the regulation catechism! The new evangelization is the way of Jesus, it is why the young prefer the likes of Bo Sanchez, whose dynamic witnessing draws many. What he does is what is lacking today, contemplation and reflection, to think how God moves in our lives. At this point, Fr. Aris gave us a few silent minutes, and asked us to remember our kids, what their pains and problems are, and not expect an easy response, but one that is in accord with God’s movement. And he asked among the audience who would want to share her/his story. Ate Cora was first to comply and shared that her husband Van was confined in the Heart Center after having been diagnosed with an irreversible illness. He is 81 and she implored her devotion, the Sacred Heart of Jesus, the greatest physician, for help. But coupled her prayer with action and prepared for any eventuality. The oxygen tank that she ordered was never used, he’s healed. Ate Rene was next to witness that she has now a unified family. Kuya Ed was last to testify that he had a freak hip accident in 2006. He went to the Orthopedic hospital and was told that they found no problem with him. Long story short, given a clean bill, he went about daily life, and flew to Davao for the wedding of son Leo, with several pictures to show for the nuptials. Then he started having pain in the hip and even difficulty in urination he had to consult a Neurologist, who discovered that his spine merely rested on a crushed hip bone that barely supported it. Leo wanted to sue the Ortho but Kuya Ed was against it and said it was a blessing in disguise that, because of the oversight, he was able to fly to Davao (and pose in every picture) for the greatest event in Leo’s and Karen’s lives. Sharing miracle experiences is for people to know God is alive, to open the hearts of seekers of truth, to arrive at the meaning of their lives. And Fr. Aris asked us to inhale (grace), exhale (bad vibes), do isang bagsak, isang padyak, and then he announced a break. 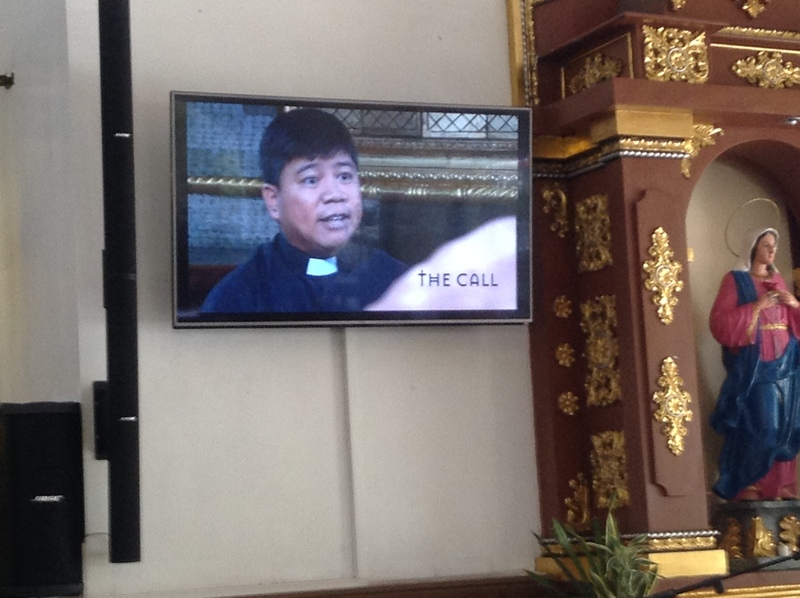 The cue for Ate Ella to show the EWTN video of Fr. Aris’ witnessing to the call. I understood why she was like a dog with two tails. After the break, he reviewed if his listeners still knew the triune goal of evangelization and the audience did not disappoint. Then he called on the sharer who was left out in the first batch. Ate Tina did not hesitate to confess that, 10 years ago, as they were driving early on Holy Spirit Drive, their car was hit by a service truck. She got out of the car and thanked Mary she was unhurt with nary a scratch, saw her husband Chito talking with the police and begged his leave because she was going to a seminar. Nearing her destination, she felt pain in her knee and called Chito and they saw a doctor who said it was nothing but accident-induced trauma. The miracle manifested itself again in October of that same year, she was going on a pilgrimage but had no visa yet; before the actual pilgrimage, she was able to get it. Next to her was Ate Letty, who was very sick and in terrible pain and depression three years ago (I witnessed her suffering). But through prayers, and supported by her fellow Mother Butler Guild members and the Legion prayer warriors, she got better and was completely healed. In thanksgiving, she is back serving the MBG, the Saturday 6 pm choir, sharing the Bible at Bukluran 2 BEC every Wednesday and Montfortian deepening sessions, whenever she can. For some people, God can be ang layu-layo kaya kailangang ilapit natin Siya sa kanila. The year 1991 was a new planning phase for evangelization, a long time to study the problem of trickling down the idea to the many who don’t know. 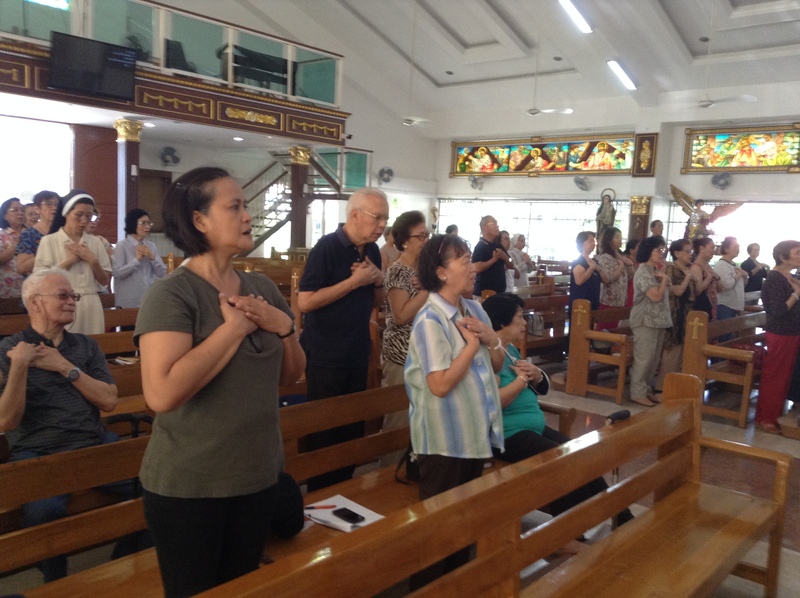 The task called for a continuance of the initiatives ignited by the Holy Spirit and fielded 115 full-time, salaried catechists, on a P28-30-M budget, to teach it in public schools. The number was still insufficient so many volunteered and trained until they were capable, and did evangelizing in the homes, not only proclaiming but living the mercy of God. We need maturity, however, because Catholics are Sacramentalized but not evangelized, ergo, cannot transfer the spiritual gift. “How is our community life,” Fr. Aris asked. Meaning, are the greeters doing their job? Meaning, the first thing people look for, upon entering the church, is the electric fan. Meaning those who expect that their favorite place in the pew is not “encroached upon”. And the old do not criticize the young on their attire, no matter how attention-getting it is. He made an example of PREX as a renewal movement, after which weekend service burgeoned because of the chosen ministries of the graduates. 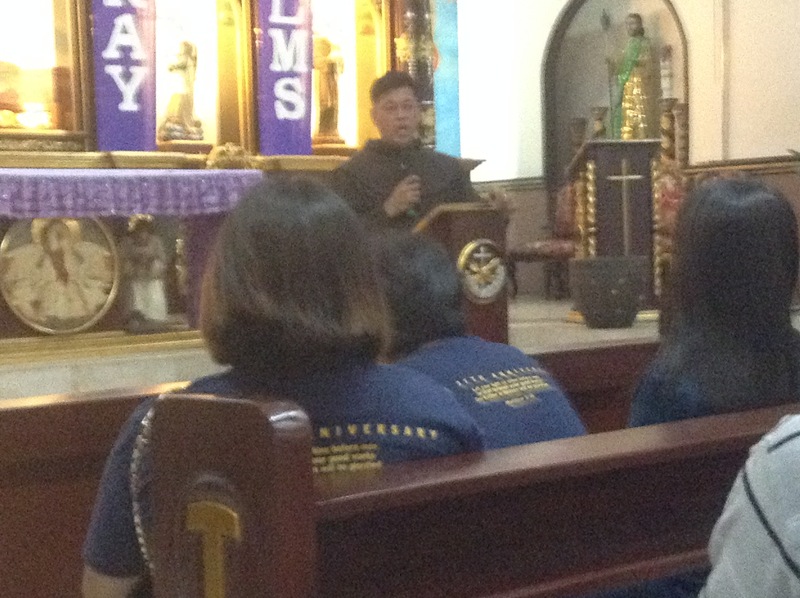 He asked about the different ministries of the Holy Spirit Parish and was saddened that nowhere is the youth represented. Evangelization, he bellowed, is the same message and a new method. The challenge of being a Christian is one and whole and indivisible wherever we are. The problem is, when Christianity came into the country, we partook of only a portion, the rest were taken by pagans, animists, etc. Then he ventured onto the beliefs about the dead, particularly when it comes to praying for three, nine or 40 days because namamasyal pa ang kaluluwa. This is not what the Catholic faith teaches, he said, for after death, God’s temporal judgment shall have been rendered and what’s left is healing and mourning for the bereaved because the Sacraments are for the living. It is, therefore, not possible to baptize the dead, whether young or old. In an emergency, however, where a baby (for example) is dying, a lay person may pour clean water on the infant “in the name of the Father, and of the Son, and of the Holy Spirit”. If the baby lives, it may be reported to the church, where a second proper baptism may be conducted, but the first ritual is more binding. Only a priest can anoint the sick, Fr. Aris continued, and he shared his experience. That he was paralyzed for two weeks in Cardinal Santos Hospital and when Monsi Raňada anointed him with oil, he was healed miraculously. Anointing, he promised, heals body and soul, although it cannot be done urgently, but in a scheduled manner. In conclusion, he left us with these gems: 1. The holy beauty and centrality of the Eucharist (exhorting “Magsimba” three times) and the consecration of the Bread and Wine (by saying “Jesus, I trust in You.”); 2. The necessity of prayer (he remembered his childhood, by the Black Nazarene, his Dad’s mouth moved but he couldn’t hear the words and his Mom in Baclaran knelt all the time); and 3. The necessity of conversion, deep metanoia, or change of mind and heart. 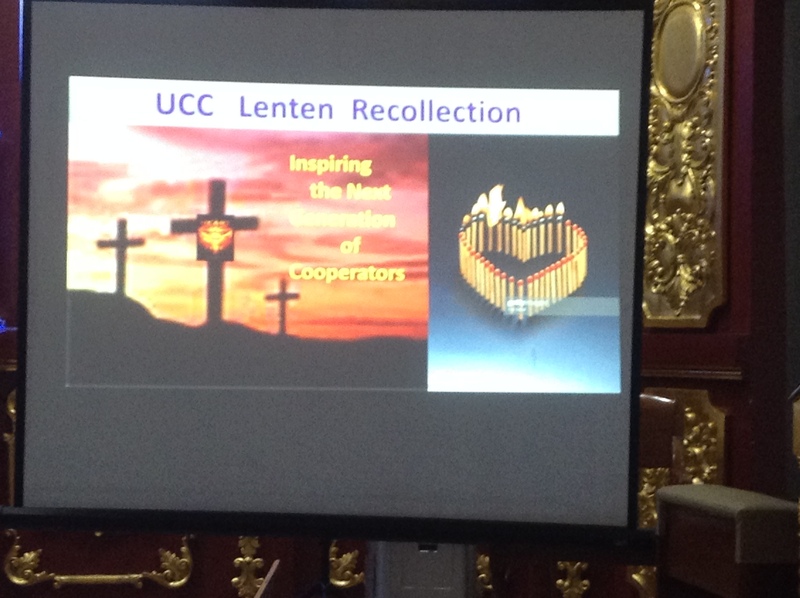 And he repeated, with us – three times – evangelization’s three goals. Amen.